4 days Train the Trainer certification program at Bangalore by Indian Leadership Academy. •How to get a mentor who can help us with Next Generation training techniques?•What are the new booming areas in the training industry? What Should Marketing/ Digital marketing tools we use to generate more training assignments?•How do we identify our audience and get them to our training easily? 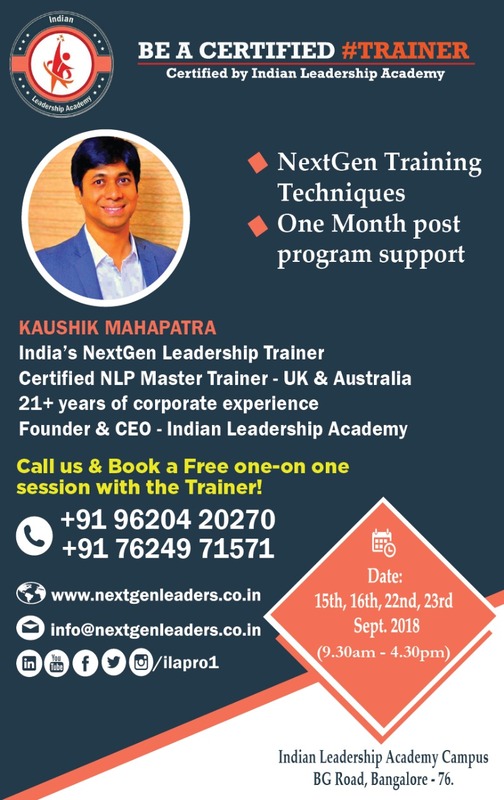 TTT(Train the Trainer) by Indian Leadership Academy gives the opportunity to unlock your training talents & explore the skills to become an Eﬀective Soft Skills or a Corporate Trainer. How to get started as a Freelance trainer or an Entrepreneur in the training industry.